Jardine's 5 Star Ranch Rub 13.75 oz. 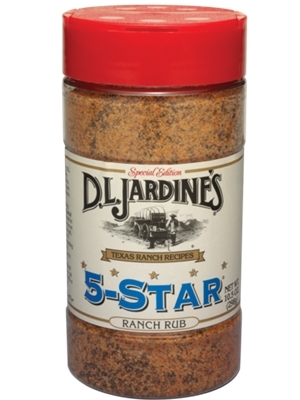 Jardine's 5-Star Ranch Rub is perfect on ribs, chicken, fish or pork. This rub is also great sprinkled on veggies or fries for an added zip! Salt, spices, meat tenderizer (salt, sugar, corn starch, bromelain (a natural pineapple enzyme)), and granulated garlic. This is the only rub I will use on my brisket. It's Great! Best seasoning mix ever! I use it on everything.